Add a casual vibe to your home with this modern accent sham. 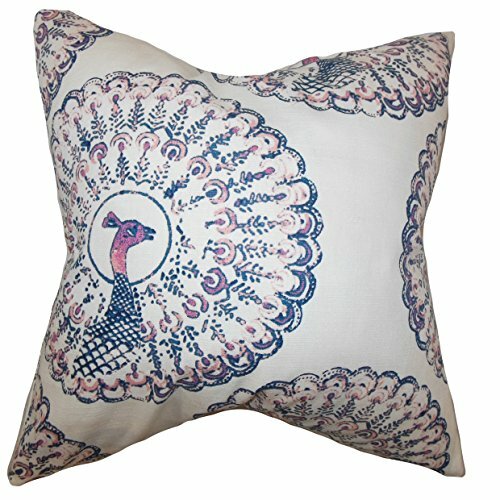 This toss sham features a peacock pattern in shades of purple, pink and white. Stylize your living room or bedroom with a few pieces of this throw sham which comes in a variety of colors. This US-made 18" sham is made of 95% cotton and 5% linen. More Details: Reversible sham with same fabric on both sides. Nbsp; Includes a hidden zipper for easy cover removal and cleaning. Nbsp; Comes unfilled and will accommodate any standardized Euro, standard, queen and king pillow insert. All four sides have a clean knife-edge finish. Nbsp; Made in the ; Dry cleaning recommended.